Blue Planet Aquarium is located by the Cheshire Oaks retail centre in Ellesmere Port, Cheshire. Whilst it is home to Europe’s largest collection of sharks, the aquarium also hosts a variety of sea life from rays to otters and tortoises. 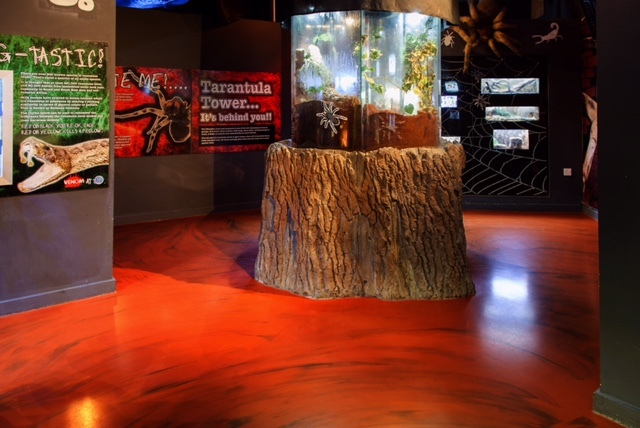 The client called upon Thelwell Flooring to provide them with advice on the current flooring throughout the Venom display area, with a view to fixing the problem. Throughout the area, there were three differing floor finishes which were affecting the aesthetics of the display and causing confusion for visitors. The Aquarium wanted to remove the three differing finishes and install one new floor finish to bring the zone together, whilst meeting certain criteria. The new floor of the Venom area had to achieve a safe slip resistance due to the area’s cascading waterfall that can often overspray onto the floor surface. Levels also had to be built up to correct the floor heights once the removal of the previous flooring was complete. In terms of the look and feel of the new flooring, an ‘Earthy’ feel and look was required to represent the venom display accurately. Thelwell chose to install Sika Comfortfloor, a tough polyurethane, seamless, system in a completely bespoke colour and two-tone finish. Sikafloor offers a slip-resistant surface and is also solvent free. The need for a hygienic flooring was essential due to the nature of the commercial space. It is known for being smooth and seamless whilst being hard wearing in wet environments – perfect for the cascading waterfall. The resin flooring offers long-term resistance to the amount of footfall that passes through the area over the course of a year. The project was complex and specific to the client’s requirements but was easily achieved with the resin floor installation after two meetings and other discussions with the client. Interactive sample panels were laid on the site allowing the client to give their input on the background colour choice ideas, along with the second colour choice. Do you need new commercial flooring for your business space in Cheshire? Contact Thelwell Flooring on 0151 200 1038 or fill out our online contact form and we’ll get back to you as soon as possible.